Students from John Brown University and College of the Ozarks were among many who served this year at Samaritan’s Purse work sites. Spring break is a time-honored college tradition. It’s a chance for students to get some well-deserved rest and relaxation, typically by lounging at the beach, splashing in the waves, and soaking up the sun. But Isaiah Wiese, a freshman at John Brown University in Arkansas, didn’t have his toes stuck in the sand during this year’s spring break. Instead, he operated a power sander, smoothing out the rough edges of Ken Hamilton’s new deck in hurricane-battered Texas. Isaiah Wiese, a freshman at John Brown University in Arkansas, spent his Spring Break alongside other university students rebuilding homes with Samaritan’s Purse. Ken’s Rockport home was badly damaged when Hurricane Harvey’s 175-mph winds ripped his neighbor’s shorefront house off of its stilts and hurled it like a fastball into the backside of Ken’s dwelling. Then came the flood waters—six feet of them—from the Copano Bay across the street. That was August 2017. Nineteen months later, Ken still isn’t back in his home of 24 years. He’s living next door in a trailer. Thanks to students like Isaiah, Ken looks forward to soon moving back into his rebuilt house. Isaiah was just one of 14 students from John Brown University who used their spring break to serve with Samaritan’s Purse and help rebuild homes hit by Hurricane Harvey along the Texas coast. John Brown University student, Beth Abdo, joyfully spent her Spring Break painting and repairing Texas homes. 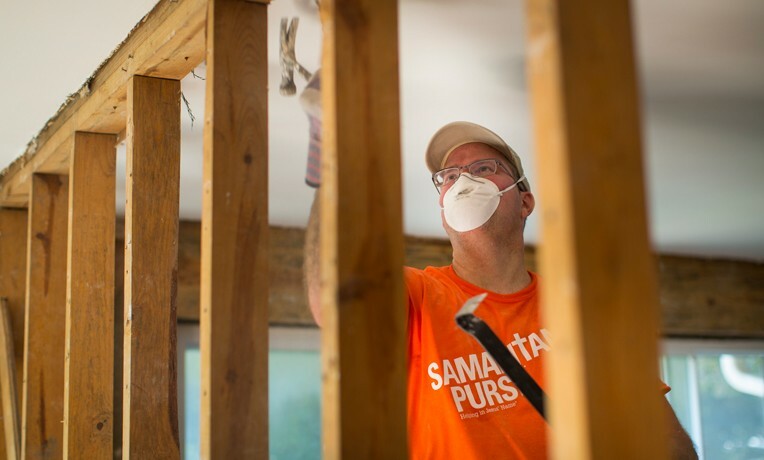 Two hundred miles northeast in Pearland, Texas, near Houston, 17 students from the College of the Ozarks (C of O) in Missouri also devoted their spring break to rebuild houses with Samaritan’s Purse. Students from College of the Ozarks learn from Samaritan’s Purse site leaders how to operate saws and other specialized tools. John and Adrianne Dunn’s two-story suburban house was flooded with four feet of water. The C of O students came to hang dry wall and doors, paint the downstairs interior, install kitchen cabinets, and lay bathroom tile. He said the experience was unlike other mission trips he has taken because he was able to combine sharing his faith with physical labor and witness firsthand the difference he made in the lives of appreciative homeowners. The volunteer experience with Samaritan’s Purse is “the best of both worlds,” he said. At another rebuild site in Pearland, C of O students are busy applying aluminum siding and flashing to Pastor Marcos Urbina’s one-bedroom house. Flooding from Harvey forced him and his wife Esther to evacuate their home of 46 years. Over in Highlands, Texas, four C of O students helped rebuild Danny and Mary Lee’s once-flooded house. Dr. Marvin Schoenecke, the college’s dean of administration, assisted in the project and explained that the school is a work college. Students aren’t charged tuition. Instead, they work an average of 15 hours per week, 280 hours per semester, to pay for their education. College of the Ozarks students were hard at work and learning new skills at Danny and Maria Lee’s home. More than 700 students from over 40 different colleges and universities served over their spring breaks with Samaritan’s Purse this year, according to Tyler Troyer, who recruits students for the ministry’s service projects. Not only did they serve in Texas, but also in North and South Carolina and Florida. Volunteer teams from College of the Ozarks and other university groups develop practical skills for life and ministry through our Samaritan’s Purse rebuild projects.